N.B. 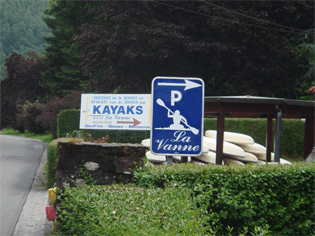 in some GPS systems you have to enter “Alle” or the name of our municipality: “Vresse-sur-Semois” or “Vresse”. Exit n°22 : Beauraing – Vonêche – Vencimont – Gedinne – Bièvre – Oizy – Chairière – Alle-sur-Semois. Exit n°23 : Wellin – Haut-Fays – Gedinne – Bièvre – Oizy – Chairière – Alle-sur-Semois. 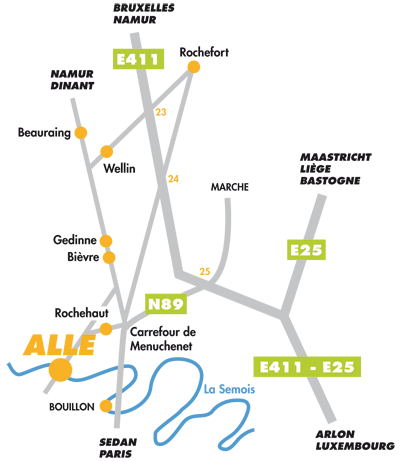 Exit n°25 : Menuchenet – Mogimont – Rochehaut – Alle-sur-Semois. 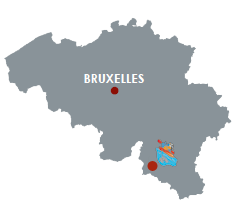 Follow : Vrigne-aux-Bois – St Menges – Ban d’Alle – Alle-sur-Semois. Cross the bridge and take the 1st left, carry straight on for 200 metres and you have reached your destination! Our sunny and pink-coloured kayaks await you at the water’s edge! 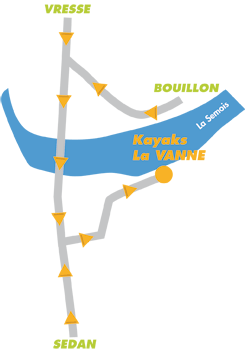 Once you arrive in Alle-sur-Semois, take the third right (there is a place selling French fries/chips called “Bintje” forming an intersection), carry straight on for 200 metres and you have reached your destination! Our sunny and pink-coloured kayaks await you at the water’s edge!